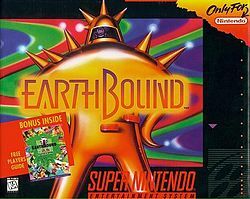 Being the super video game nerd that I am, I always wanted to play Earthbound, since I didn’t play it way back when it came out on Super Nintendo so very long ago. I recalled it being in the really big box with a guide, but I just wasn’t playing many games at the time as I was so busy with school and working part-time and all. So when I saw that Nintendo released Earthbound for download on the Wii U, I was pretty excited to finally gvie it a shot. Plus, I really needed something to play at the moment too. Despite being an old Super Nintendo game with now ancient, graphics, sound and gameplay, it was still a pretty amazing game. I was always such a fan of the JRPG’s growing up (especially on the Super Nintendo), and to play such a great one was a treat. The story was pretty entertaining. Very funny and quirky, and a great change from the typical JRPGs. What an amazing game. The dialog was pretty funny too. If I were a kid (I guess I still am if I got so excited over a game) it’d of been pretty hilarious. The only drawback might be the difficulty at the very beginning of the game. It got pretty tough there, but after some good old fashioned 90’s level grinding was able to get through it. Awesome game, and I will now say “fuzzy pickles” whenever I take a photo. Though I have no idea what that means.